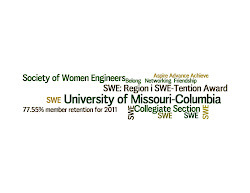 On Wednesday October 28th from 5:00 pm - 6:30 pm at the Boys and Girls Club of Columbia SWE will be teaching young girls, grades kindergarten to grade 5, about engineering. Volunteers are needed! Don't volunteer if you don't plan to uphold your commitment! For more information or how to help out contact Kim Suhre at kns6wc@mail.mizzou.edu.